It’s relatively easy to mistake pistol grade steel for rifle grade. Thickness of the plate isn’t the sole determiner. It’s a matter of thickness and hardness as well as strength of the steel, bullet configuration and bullet energy. Bounce back is a serious problem. I’ve seen a double ricochet (off the steel target into the rock backstop) strike an observer standing behind the firing line. She was lucky the bullet fragment found her arm and didn’t crack her skull. Up close drills using steel require armor. At a minimum face, head and neck protection is required unless frangible bullets are used. With frangible ammo, the bullet should shatter into a fine powder and low weight fragments with very little energy to cause damage. That’s damage to both the steel and the shooter. 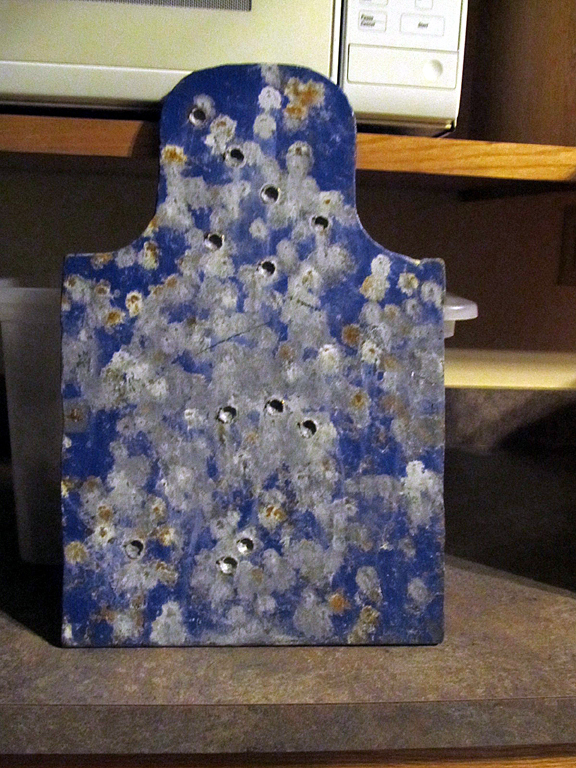 Somebody managed to shoot up four steel pistol plates at my favorite range. This is both a financial loss and a serious safety problem that needs to be corrected. The four plates are $300 of targets turned into scrap steel worth 59 cents a pound. There is also a shooter who at best is ignorant or at worst unconcerned, and is willing to place himself and others in danger. Fortunately nobody was hurt and none of the club members were involved. The miscreant was someone from another organization using the range. Corrective action has been taken to educate the shooter and make him a safer shooter. The range is taking a few additional steps to insure this problem doesn’t happen again. Let me give you some simple guidelines for shooting steel. In the absence of special frangible rounds, all steel found on a pistol range should be considered pistol-only grade. Normal rounds like FMJ, lead, softpoint or JHP are fine but no armor penetrators, no Max Max loads. You should stay at least 10 yards away and wear safety glasses. All spectators should also be wearing safety glasses. 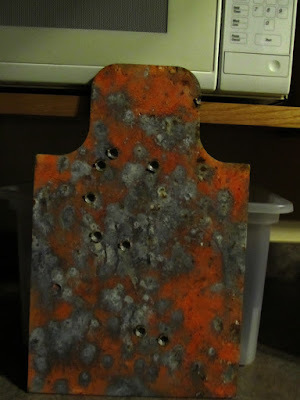 Steel found on a rifle range, in the absence of other notifications, can be considered rifle grade at distances of 100 yards or more for most rounds up to.30 cal. If you’re shooting some hot little wildcat or a massive moose annihilator load or armor piercing .50 BMG (you know who you are) you need to get permission or bring your own steel. Shooting sports, regardless of their nature, are dangerous and potentially fatal activities. It is only our strict adherence to safety rules that enable us to enjoy these activities. Make sure you know the range rules and follow them.